Our grim, multicolour, flashing future. One of the quieter announcements that Apple made during its WorldWide Developers Conference recently was that its forthcoming MacOS and iOS updates will give developers the ability to create “Content Blockers” for its mobile and desktop Safari browsers. While the exact content blocked is up to the developer (you could block the Daily Mail if you want—and you really should), no one is under any illusions as to the target of this feature: ads. Ad blockers already exist as extensions to most existing browsers, but the majority of users probably don’t avail of them, especially in the mobile sphere. Apple’s decision to push this feature and the reaction to its quiet announcement says a lot about the current state of the mobile web and the dominant role that ads have come to play in it. 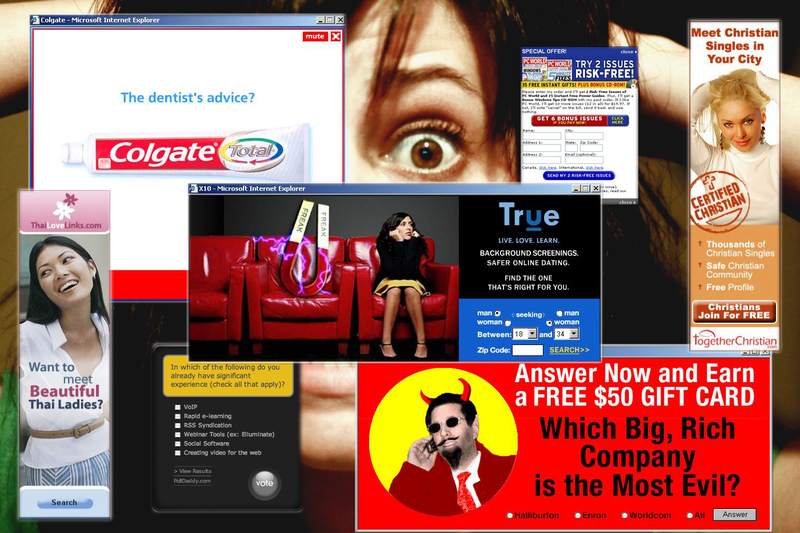 Faster computers, mobile phones and broadband have contributed to a smoother experience online, but this has helped to hide the fact that the vast majority of what we download is ads and spyware. Blocking out most of that would massively speed up browsing and have the simultaneous benefit of cutting down on the amount of activity tracked online. As pleasant an outcome as this sounds though, there’s a downside: online advertising pays the bills for many of the sites we enjoy, some of them from smaller content providers. Killing off that revenue stream would likely kill off a lot of the richness and the niche content that the web provides. It’s not like the people running these sites are preying on you through the ads either—they’re often stuck in a system that they don’t like, making do as well as they can. The power blocs behind online advertising inform the nature of the system and the conflict that Apple is wading into. Facebook and Google ensure that web users have access to a wealth of content for free by harvesting their data and selling it, funnelling a portion of the proceeds back to the content creators in order to keep the whole thing going. This is the system that’s driven the growth of the web to date, but it’s far from perfect, and web site bloat is just one of the symptoms. Whatever your thoughts on Apple—you won’t look at the comments on any Apple article on a non-Apple site for long before you find mentions of ‘iSheep’ or ‘Apple fanboys’—the fact is that Apple’s profit model is completely different from that of the web titans. Apple’s iAds platform is distinctly small scale, and its money comes from the sale of hardware instead. Providing an improved user experience is vital to enhancing the sale of that hardware, and enabling the creation of content blockers achieves that. Safari is a minority browser on desktop machines, but it’s a major player on the mobile web, and iOS users are a lucrative market. So while this initiative isn’t going to bring down the current financial underpinnings of the mobile web, it’s a definite shot across Google’s bows. (Less so Facebook, which has a closed ecosystem of its own that it can profit from.) For users, it raises the question: are we happy to receive things for free, with the understanding that we’re being sold in return, or are we going to accept that we should pay for the things we value? There’s an interesting parallel to be seen in the U.K., where the Tory government is once again taking the knives to the public broadcaster, the BBC. U.K. TV viewers have long been accustomed to paying a TV licence, and in return they’ve gained a globally renowned service that entertains, educates, and informs. Of course, a publicly funded broadcaster has a head start over its private sector rivals, and in the view of the Tories, that’s unfair competition. Speaking as someone who was raised on a diet of BBC television, I’d call the licence fee a small price to pay, but the future that the private sector envisions could look a lot like YouTube: ostensibly free to use but scattered with pop-up ads and laden with user tracking. When we’re offered something free, it’s convenient to overlook the fine print. We’re okay with being the product as long as it’s not thrown back in our face. It would be nice to think that users’ desire for speed and convenience would eventually find a balance with providers’ need for compensation. But while Apple’s intervention might be to our benefit, Apple doesn’t fund web content, only content provided through its own app store ecosystem. So if its ad blocking does gain traction, either we’re going to have to learn to pay for our content or some of those content providers are going to go under.